> This win certainly didn’t come as easy as it should have. But in the end, a win is a win; and a much-needed win for the Brewers. > The Brewers defeated the Padres today, 6-5, in what became a nail-biter in the ninth inning. After Ryan Braun’s two-run home run in the eighth inning, it looked like the Brewers had an easy win that was theirs for the taking. But it didn’t turn out that way in the ninth inning. It was a dismal start to the day, as Yovani Gallardo promptly gave up a lead-off home run to Will Venable. The ball didn’t appear to be hit that well, but it turned out that the ball was carrying a lot today. Gallardo actually nearly gave up another home run to Chase Headley in that same inning, but it was robbed by Braun in left field. Again, the ball wasn’t very well hit; both of these balls were opposite field home runs (Venable and Headley are lefties) that would have been routine fly balls on any other day. Anyway, Gallardo gave up another run in the second inning. With a man on second, Gallardo attempted to field a grounder from John Baker, but it went through his legs for an error, leaving men on first and third. Everth Cabrera then grounded out to score the run, although it looked like there could have been a play at the plate. But first baseman Taylor Green picked up the ball and just stood there looking at home instead of throwing, and first became his only play. The Brewers had runners on base against Padres starter Anthony Bass all day, but couldn’t capitalize on their chances until the sixth inning. Norichika Aoki led off the inning with a single. He then stole second but got to third because the throw sailed into center field. Braun drove him in with an RBI single to cut the Padres’ lead in half, 2-1. After Aramis Ramirez and Green both flew out, the Brewers chances that inning weren’t looking very good, but then Rickie Weeks drew a walk. A batter later, Martin Maldonado once again came through in the clutch with a go-ahead, three-run blast, just like in the first game of the series. This gave the Brewers a 4-2 lead. Then, like I said earlier, Braun hit a two-run home run in the eighth that appeared to be just icing on the cake at the time. But it turns out those were two very important insurance runs that won the Brewers the game. The ninth inning was just flat-out ugly. As far as the relief-pitching goes, it was the Brewers’ fundamentally worst inning of the year. John Axford came in to start the inning, but wound up recording just one out before the floodgates nearly opened. Chris Denorfia hit a one-out single, Venable doubled, and Logan Forsythe walked, all in sequence. Axford then gave up an RBI single to Headley, and followed that up with a bases-loaded walk to Carlos Quentin. The score was now 6-4, and marked the end of Axford’s awful outing. He threw 37 pitches and recorded just one out; more proof that he can’t pitch in non-save situations. Then Jose Veras came in, which immediately got me thinking that the game was over, in a bad way. But, he struck out Yonder Alonso on eight pitches- all curveballs. Now there were two outs; any kind of out felt wonderful that inning. But Veras came back to walk Jesus Guzman, and now no mistakes could be made. There couldn’t be a walk, a hit, or anything. Veras needed to record an out no matter what. But, Veras came through in the clutch to strike out Baker on a 3-2 count- probably the biggest pitch any Brewers pitcher has made all year. That closed out the Brewers’ 6-5 win, and Veras was rewarded with the save. This whole ninth inning frenzy sort of sucked up the fact that Gallardo actually turned in a decent outing after his shaky first two innings. He went seven innings while giving up two runs (one earned) on five hits. He walked two and struck out five, earning his fifth win of the year. > Just a few days ago, I wrote about how we shouldn’t have expected Maldonado to put up very good offensive numbers, at least right away. But he’s proved everyone wrong so far, especially this series. Maldonado has brought his average up to .235 (he was down at .133 just a few days ago, mind you), and has come through when the Brewers needed him to this series. He hit a three-run home run the first game, a go-ahead RBI single yesterday (although the lead didn’t hold), and a three-run homer today. In other words, he’s been by far the Brewers’ biggest source of offense this series. By the way, I already mentioned that both home runs were go-ahead home runs, but that only adds on to his clutch factor. > Ron Roenicke announced that, when ready, Marco Estrada will step back into the rotation in place of current fifth starter Michael Fiers. After Fiers’ first career start in Los Angeles, I was pumped and hoped he would be the five guy for the rest of the season. But, he hasn’t fared as well in his past few starts, having sub-par outings against both the Pirates and Padres, two of the worst offenses in the National League. Fiers will get at least one more start, but, at this point, I’m fine with Estrada returning to his role when he’s ready. Fiers would probably then move to the bullpen as a long man, or get sent back down. As you can see, Greinke is going to be starting against the Royals in the first game. He has never faced them, but is still very familiar with them. 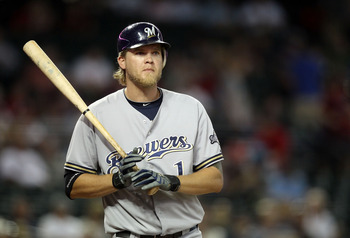 He was drafted by the Royals, and spent his entire career with them until he was traded to Milwaukee in December of 2010. Greinke has been great at home since coming to the Brewers, but Kauffman Stadium should feel like home to him. > Anyway, that’s about it. Thanks for reading, and feel free to leave your thoughts. HR: Maldonado (3), Braun (15). TB: Maldonado 4, Braun 5, Maysonet 3, Aoki, Green 2. RBI: Braun 3 (40), Maldonado 3 (10). E: Gallardo (1), Weeks (6). Pitches-strikes: Gallardo 104-64, Rodriguez 22-13, Axford 37-21, Veras 17-7. Groundouts-flyouts: Gallardo 13-4, Rodriguez 0-2, Axford 0-0, Veras 0-0. Batters faced: Gallardo 29, Rodriguez 5, Axford 6, Veras 3. > You can’t blame Martin Maldonado for only hitting .214 right now. He was thrown into a fire that he probably wasn’t ready for: being a starting catcher in the Majors. Defensively, he’s handled himself well, but is still finding his way with the bat. Maldonado was never known as an offensive catcher until last year, when he broke out for a .321 average in Triple-A. But still, he was forced into the situation thanks to- technically- Jonathan Lucroy’s wife. Anyway, just as it took Lucroy a while to get used to hitting in the Majors back after his call-up in 2010, it’s taking Maldonado a while as well. > But Maldonado took a big step forward offensively today in the Brewers’ 9-5 win over the Padres. His home run in the fourth was the decisive blow in the slugfest, and gave the Brewers a lead they wouldn’t again relinquish. But Maldonado wasn’t the only offensive story tonight. Corey Hart had yet another multi-home run game- two solo shots, both off of Pads starter Edinson Volquez (who the Brewers have a history of hammering from his days with the Reds). Shaun Marcum didn’t have his prettiest start of the year, but it was good enough tonight. He went 5 2/3 innings while giving up three runs on six hits. He also walked three and struck out six for his fifth win of the year. The Brewers got on the board immediately in the first on Hart’s first home run of the game, which was a leadoff shot. But, in the third, Everth Cabrera hit an inside-the-park home run, courtesy of a misplay by center fielder Carlos Gomez. The Padres then took the lead in the fourth, thanks to a bases-loaded walk to Cabrera by Marcum. But then came Maldonado’s big blow. In the Brewers’ fourth, Maldonado hit a go-ahead three-run shot to make the score 4-2. This was by far his biggest moment as a Major Leaguer so far. In the fifth, the Brewers tacked on two more runs on Hart’s second homer of the game, then an Aramis Ramirez RBI groundout. The Padres then got one run back on Cameron Maybin’s solo home to make it 6-3. But, in the seventh, the Brewers extended their lead even more, first on a Rickie Weeks sacrifice fly. Then, Taylor Green hit his second career home run, a two-run blast. The Padres got two more runs in the ninth on Logan Forsythe’s two-RBI triple, but it wasn’t near enough to start a rally. > Here’s an interesting (and encouraging) fact. The last Brewer to hit his first two career home runs in pinch-hit appearances was Prince Fielder. We all saw what kind of career he had in Milwaukee before joining the Tigers before free agency, and it was one heck of a run. But the reason I bring this up is because Green’s first two home runs have come under the same circumstances: both were in pinch-hit appearances. Obviously, other than those two home runs, Green has shown the potential to be a utility guy who comes through every so often, at least in the Majors. But we have to remember he was an extreme power hitter in the Minors, with 36 home runs and a .336 batting average in Triple-A last year. So he could be hitting his stride after a few months in the Majors, and I’m just saying- he and Fielder had similar starts. > The Brewers have successfully signed their top two Draft picks from a few days ago. They signed their first pick (27th overall), power-hitting catcher Clint Coulter, with a $1.675 million bonus. Power-hitting (but injury-prone) outfielder Victor Roache, their second pick (28th overall), signed with a $1.525 bonus. Anyway, I might do a more in-depth analysis of these guys sometime next week. > And that’s about it. The Brewers will play the second game of this series tomorrow at 3:10 PM CT. They’ll send Michael Fiers (1-1, 3.75 ERA) to the mound for his third career start. He’s had mixed results in his first two: he dominated the Dodgers in LA last week, but lost to the Pirates after serving up back-to-back long balls in the fifth. The Padres will counter with ex-Cub Andrew Cashner, who the Brewers have seen a bit of out of the Chicago bullpen. Cashner was used out of the bullpen by the Padres earlier this season, and put up a 3.81 ERA. This is his first start of the season. Anyway, I’ll probably add the box score tomorrow. But for now, thanks for reading, and feel free to leave your thoughts.